I don't have many rules in my life, but one I never break is: if Ryan Holiday writes a book, I read it as soon as I can get my hands on it. This is a book I want every athlete, aspiring leader, entrepreneur, thinker, and doer to read. Ryan Holiday is one of the most promising young writers of his generation. The Comedian BIll Hicks said the world was tainted with fevered egos. In Ego Is the Enemy, Ryan Holiday writes us all a prescription: humility. This book is packed with stories and quotes that will help you get out of your own way. Whether you're starting out or starting over, you'll find something to steal here. Inspiring yet practical... teaches us how to manage and tame this beast within us so that we can focus on what really matters - producing the best work possible. The lessons in this book are ageless and universally applicable to everyone. The lesson it teaches us is that the ego is part of us and we have to manage it. Life is full of ups and downs and our ego is always sitting in the dark, waiting to strike us down. 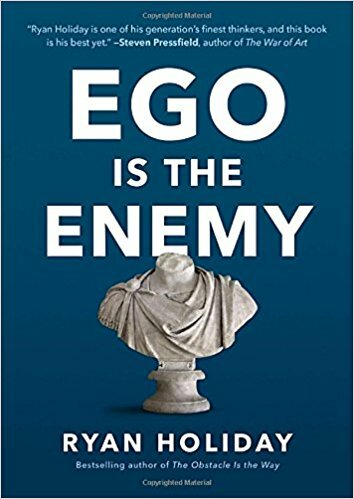 Oh, and let's not forget, Ego Is The Enemy by Ryan Holiday. It's rare that I finish a book then immediately reread it, this time with a yellow marker in hand…I can't recommend this book highly enough. As in The Obstacle is the Way, Ryan Holiday delivers practical and inspiring philosophy, this time exploring a powerful concept that runs back centuries, across borders and schools of thought: ego. Ego is our biggest enemy. Early in our careers, it can prevent us from learning and developing our talents. When we taste success, ego can blind us to our own faults, alienate us from others and lead to our downfall. In failure, ego is devastating and makes recovery all the more difficult. It is only by identifying our ego, speaking to its desires, and systematically disarming it that we can create our best work. Organised into bite-sized observations featuring characters and narratives that illustrate themes and life lessons designed to resonate, uplift and inspire, Ego is the Enemy shows how you can be humble in your aspirations, gracious in your success and resilient in your failures. It is an inspiring and timely reminder that humility and confidence are still our greatest friends when confronting the challenges of a culture which tends to fan the flames of ego and encourage the cult of personality at all costs.